When it comes to giving a good presentation, I look for two things from the speaker: caring and meaning. I want to see that she cares both about the audience and her own message. But I also need a presentation to mean something to me. Computers and Google can indeed give us routine information and facts we need. What we want from people who stand before us and give a talk is that which data and information along cannot: meaning. Think about the data-heavy field of science communications: talks, lectures, speeches, articles about biology, the environment, health or economics. Information has become plentiful, so anyone standing in front of us is unlikely give us a fact that we can’t easily find on our phone. But it’s harder to find wisdom on the phone, no matter how smart it is. To take creatively match facts with ideas, to join them into coherent trends, and then to express a message in a tone and at a speed so synchronised that the speaker and audience are traveling together -- this cannot be done by a phone. As Garr says, people don’t want facts transferred into their heads from yours, they want to hear ‘the story of your facts’. Stories can be one of the best ways to include meaning in a presentation. At Public Affairs Asia's recent Corporate Affairs Forum here in Singapore, one of my favorite talks was a case study of how Weber Shandwick and Danone Nutricia managed a botulism scare. I didn’t take any notes from the talk because I was listening so carefully, imagining myself in the story, and making connections between that story and situations that I’ve been in myself. But not only did I take away new meaning about crisis communications, I happen remember the details too! 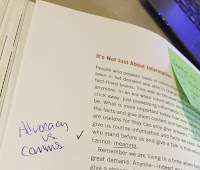 Taking care to include meaning in a presentation can also help us go beyond mere communications into the realms of advocacy. We're not just informing people, we're bringing them on a journey toward a new way of thinking. This is especially important for those of us tasked with raising awareness and support for public sector and NGO development work to reduce poverty -- work which increasingly requires complex, nuanced work full of metrics and data. But if the work doesn't mean anything to donors and voters, it won't get funded. Meaning helps our facts stick and makes our ideas persuasive, turning good presentations into a great ones.